Holiday River Expeditions offers several rafting tours that are ideal for beginning youths. The Green River rafting trip flows through Gray Canyon. Class I, II and III rapids are plentiful during this 12-mile journey and children ages five and up will especially enjoy the plentiful wildlife that includes various large birds and big horn sheep as well as canyons with ancient petroglyphs. The Colorado River tour is a 16-mile tour with beautiful views of the LaSal Mountains and ancient Fisher Towers. This tour is perfect for children five-years- old and up. The Fisher Towers Canyon trip is available June through August for ages five and up. This trip is between two to three days in length and highlights the beauty of the Colorado River. With enormous looming sandstone monoliths and the LaSal Mountains, the desert beauty will awe children. Class I, II and III rapids make it perfect for beginners, including large groups of children. The area is a natural haven for bald eagles, snowy egrets and blue herons. The Desolation Canyon trip is perfect for ages five and up and highlights the beauty of the Tavaputs Plateau, which forms a gorge that is deeper than Arizona’s Grand Canyon. Surrounded by more than one million acres that are largely uninhabited, the remote canyons, sandy beaches and crystal-clear water streams make this an excellent tour for beginners. 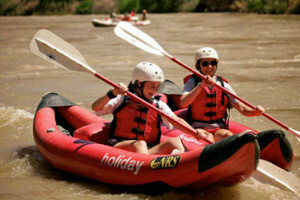 The San Juan River rafting youth trip is also a perfect beginner excursion for children five-years-old and up. The warm water rapids lap into the raft, past limestone swimming pools and ancient cultural Pueblo Native American sites. This three- to four-day tour is perfect for children. 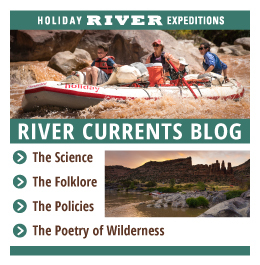 Holiday River Expeditions employs top-notch guides that enjoy teaching newcomers and children how to navigate and explore rivers. Knowing they are teaching the future of tomorrow, the guides focus on making the excursions fun and enjoyable for children. Not only will children have a great time, the guides impart valuable wilderness knowledge along the way, teaching them about the native plant life, animals and cultural sites. The guided river rafting trips are fun for children, helping impart knowledge of the great outdoors that will stay with them for a lifetime, and preferably ignite an inner love and appreciation for the beauty of these millions-year-old sites. From seeing ancient petroglyphs and Pueblo Native American sites, fresh water fish, native avian species, jaw-dropping scenery and gleeful children screaming in delight as they race down the rapids, these excursions are a delight for children of all ages.